Born in Warwick, Bermuda on January 22, 1843 to George John Patton and his wife, Mary A. Steele Patton, Francis L. Patton never became an American citizen, though most of his adult years were spent in the United States. Nevin’s Presbyterian Encyclopedia indicates that he received his education at the University College in Toronto, followed by preparation for the ministry at both Knox College, Toronto and Princeton Theological Seminary in New Jersey, graduating there in 1865. Rev. 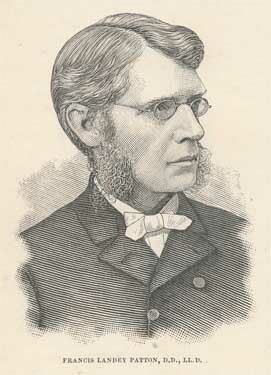 Patton was ordained by the Presbytery of New York on June 1st, 1865 and installed as pastor of the 84th Street Presbyterian Church, and then served two other Presbyterian churches in the New York City area before moving to Chicago in 1873 to pastor the Jefferson Park Presbyterian Church. Dr. Patton also served concurrently as editor of The Interior, 1873-76 and as professor at what is now McCormick Seminary, 1871-1881. Capping his ministry in Chicago, he was honored to serve as Moderator of the General Assembly of the Presbyterian Church, U.S.A. in 1878. 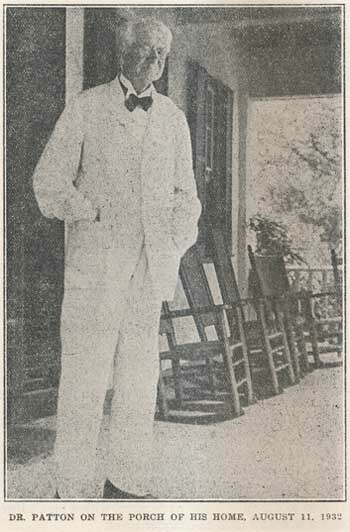 During those busy years, Dr. Patton was engaged as the prosecutor in the heresy trial of the Rev. David Swing, in 1874. The national attention given to this trial may in part have led to the call issued by Princeton Theological Seminary, where Dr. Patton then served as professor of apologetics from 1881 until his retirement in 1913. “When I met him last August, he was in his 90th year, yet seemingly in good health, unbowed in stature and alert of mind. Although handicapped by loss of eyesight, years had not dimmed his spirit, his well-known keen sense of humor, or his interest in old friends, his beloved Princeton and the work of the Presbyterian Church. 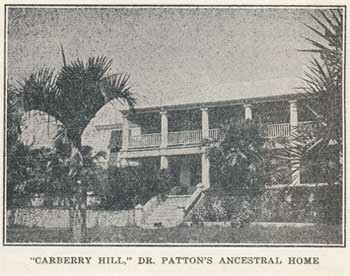 He and Mrs. Patton were living with their son and daughter, Mr. and Mrs. George S[tevenson] Patton, at “Carberry Hill,” the stately old mansion in Warwick, Bermuda, where Dr. Patton was born and where he has lived since his retirement . . .
“. . . he was presented by his parents in Christ Church, Bermuda. It is significant that this child destined to be the powerful supporter and valiant defender of the faith of his fathers, should have been dedicated to the Lord in this historic church—the oldest Presbyterian church in the British overseas empire. Who can doubt that this great life work was but an answer to the prayers offered by his godly parents on that day? . . .
“. . . November 25, 1932, after a short illness, he died, and the Presbyterian Church throughout the world faltered at the loss of its beloved patriarch. at may seem an unprofitable failure will be used of the Lord as He refines us for greater service. “The steps of a good man are ordered by the LORD: and he delighteth in his way.” (Psalm 37:23, KJV).